Elsa Gonzalez, 57, a patient navigator at Mt. Sinai Hospital (red coat) gathered to pray with a group of other women near the site of the explosion that leveled two East Harlem apartment buildings Wednesday. They are just some of the East Harlem and Harlem residents who have gathered to help their neighbors in the wake of the tragedy by doing things like collecting money, clothing, food or offering temporary housing to the displaced. "The community is hurting, we are hurting," said Gonzalez after the impromptu public praise session. "Why not get together?" HARLEM — The seven women seemingly appeared out of nowhere on the corner of 116th Street and Lexington Avenue Friday morning. They quickly formed a circle a few steps beyond the metal police barricade, grasped hands and began sending up prayers in Spanish and English for the victims of Wednesday's gas leak explosion that demolished two East Harlem apartment buildings hundreds of feet away from where they were standing. "Aleluya" one woman said repeatedly in Spanish. "Bring healing O' Lord, Jesus," another said in English. "The community is hurting, we are hurting," said one of the women, Elsa Gonzalez, 57, a patient navigator at Mt. Sinai Hospital after the impromptu public praise session. "Why not get together?" The prayerful women are among the everyday people of Harlem and East Harlem who have come together to help the families of the 8 people who were killed in the blast, the 60 or so who were injured and at least another 55 families, including 50 children, who were displaced from their homes. The need is great. The Rev. Thomas Perez of the Spanish Christian Church, which was destroyed in the explosion, had five members killed in the blast, two injured and 10 left homeless. "We don't know how many may need clothes or how many may need furniture," said Perez. To help, a local bookstore has transformed itself into a drop-off point for donations, local restaurants delivered prepared food to temporary shelters, the president of the Mount Morris Park Community Improvement Association, one of Harlem's wealthier neighborhoods, gathered information from people willing to provide free temporary housing and the East Harlem Merchant's Association began collecting toys, clothes and water. "Everybody has a role they can play," said East Harlem Assemblyman Robert Rodriguez who described the community response as "amazing." "I'm so proud of the response from this community," he said. Just an hour after the tragedy, with people still in shock and some unsure whether anyone they knew had been affected, small informal networks in Harlem began buzzing about ways they could provide for their neighbors. Aurora Anaya-Cerda owns La Casa Azul bookstore on East 103rd Street between Lexington Avenue and Park Avenue. A neighborhood hub known for its author readings and gatherings, the store began getting calls and texts about ways to help not long after the blast. Anaya-Cerda began putting links to the Red Cross and other sites on the store's blog and then decided to do more by becoming a collection center for supplies. "We decided to do this as a way to support our neighbors. Our bookstore is 10 blocks away. We have staff who live close by and know so many people who have been affected that we feel this is just part of our responsibility," said Anaya-Cerda. Just a day later they have 115 bags of clothes, food and water with people coming from as far as Westchester to donate. They will collect supplies through Sunday and then drop them off at Rodriguez' office to be distributed. "I wouldn't say we are surprised by the response because this is what East Harlem is about. The response is a reflection of what we do for one another every day," said Anaya-Cerda. Raphael Benavides, president of the East Harlem Merchants Association was directly affected by the tragedy. He was friends with victim Andreas Panagopoulos, 43, who was a regular at the Poet's Den Gallery and restaurants that Benavides owns. "He was a happy-go-lucky person who loved hanging out with friends and being with family," said Benavides. Absolute Piano, which was on the ground floor of one the destroyed buildings, was a member of the merchant's association and always provided the Poet's Den with pianos for its performances at reasonable prices, added Benavides. With all of the devastation, the merchant's group decided to act and is also collecting items for donation. 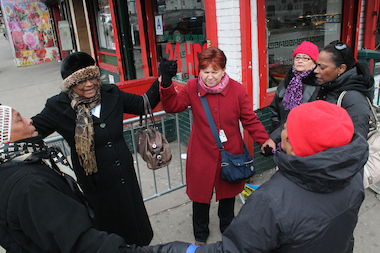 "One of the great things about East Harlem is that everyone knows everyone," said Benavides. "Neighbors want to make sure East Harlemites are being taken care of by East Harlemites. People are saying they are not going to let something like this happen and not respond." But it's not just East Harlem residents that are stepping up. Mayor Bill de Blasio announced Friday that the city would house families affected by the blast by moving them into temporary or permanent housing. But in the hours after the blast, with windows from buildings in the vicinity blown out and people evacuated for safety reasons, Community Board 11 wanted to identify temporary housing options. Sam McClendon, 66, a writer and president of the Mount Morris Park Community Improvement Association, was about to head to an appointment when she heard news of the blast. "I asked myself 'Why am I just going about my daily life when this is something that happened six blocks away? We need to do what we can to help. This is the not the day to go about life as usual," said McClendon. She reached out to CB 11 Chairman Matthew Washington who mentioned that temporary housing might be an issue. McClendon reached out to the group's network. Within five minutes she began getting responses from people who had an empty apartment or a floor in their brownstone, a spare bedroom or just a futon. Before the day was through McClendon had collected and organized 25 temporary housing possibilities. "Harlem is an interconnected community. If this can happen on the east side of 116th Street it can happen on the west side," said McClendon. "If you are not the ones feeling the impact then you need to be the one finding the solution." The group has now moved on to collecting items and helping to coordinate fundraisers. Just after the blast, Chantilly Mers, associate pastor at Metro Hope Church which meets at the National Black Theater at Fifth Avenue and 125th Street, began walking around to the restaurants and stores in the area and soliciting restaurants to make donations. "Sometimes communities don't know how to respond after a tragedy and we wait for the first responders to show up," said Mers. "What some don't realize is that we are the first responders.